In the Task Force in Prague you’ll come a cross Peter Chang, from whom you’ll get the next side mission SM 05: Samizdat in Deus Ex: Mankind Divided. He is in panic because he has discovered a hacking attempt on the server of the Front Company. He will give you the address of the hacker and Adam Jensen promises him that he takes care of business. Now you must leave the TF29 and enter the selected building 302 in Hlavni 33. The door to the apartment is naturally protected by a password. You can simply break the door or you can climb over the balcony of the staircase through the window. Look around the room, because here you will find useful software (Messenger) to hack the laptop, which is in the room. Read the e-mails and select left of the screen of the Messenger. Then you’ll get the access code 5431 and the location of the hacker. You have found that the hacker is a member of samizdat, an illegal pirate radio station. Follow the waypoint to the sewer and enter. Go through the underground passage, until you come to a ladder. From here you can already see the access to the hidden office of Samizdat. Move the cardboard to the side and go through the hole. Step into the room, you can immediately talk to the self-styled journalists and try to convince them to leave the front company of TF29. Perform the "negotiations" correctly, and then K will propose you a deal that you can accept. - Argue: I am nothing here. I just need your cooperation. - Samizdat and K: These answers give you additional background information. - Next: Praha Dovoz, you must let him rest, but not for the reasons that you think. - K expected of you, that you serve him instead worry about dirty Picus. - Collaborate: All right, what do you want to know about Picus? Apparently the Palisade bank wants their rich customers have well under control and so you can get there information, for that Picus Media will charge. 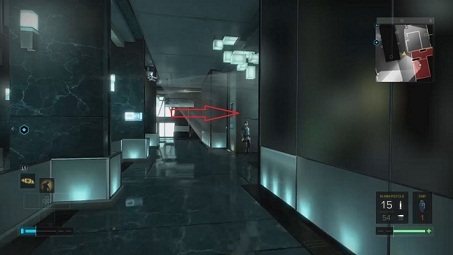 However, this means that you have to stop in red areas of the bank. The Bank itself can enter without problems, however, you must then use the elevator to enter the locked premises in order to find the incriminating files. - On the same floor on which the path marker is located is an elevator. The picture shows you the way there. - Take the elevator and go down to the vaults. Just to the left next to the elevator is a closed space. Hack the lock and enter. - On the counter in this room you will find the access card for the Palisade Elevator. Grab this and everything else that can be found therein. - Go back to the elevator and use the card on the card reader. Now you can go to the locked floor. - The waypoint shows up already, the door for the next round. However, it is not so easy, because the room is guarded by two security guards. Right after you open the door, there is guard, you can take him quietly. - You can sneak past the second guard, because you have to walk up the stairs. But beware! Here there is a camera. Once the beam turns away from you, you can move quickly to the door. - Hack to enter, and then examine the desk in the room. There you will find a file, which proves that Picus holds water contamination secret. This part of the side mission SM 05: Samizdat is simple. Leave the building Palisade Bank and follow the waypoint back to the quarters of the samizdat. You can CONSULT K and learn a bit more about conspiracies and Dubai, that you will get the PROOF GIVE to the last section of the side mission SM 05. Next, bridging the information center of the city should not be difficult to you. Just follow the marker up to the house, in which the mast is. Before the house there is a platform, which can use with a Biocell. Then move on to the roof, where you can bypass the Information Centre. Hack the poorly protected mast and select REMOTE ADMIN ENABLE - SM 05: Samizdat is solved!